Until it appears and begins to use the salt can not talk about sausages. Salt appears in the years 3000 _. BC in the reign of Simer, where spicy foods (like meat and fish) _ were used in trade. Salt was a bit expensive as it was not as common as it is now, for example the Egyptians acquired it in the desert, and the Jews in the Red Sea. In prehistoric times, man, better preserved by cutting meat into thin strips and letting them dry in the sun. Sometimes the meat extracted and polvorizaban and mixed with fat. Later with the discovery of fire, possibilities for increased conservation and can benefit from the use of smoke and cooking. In prehistoric times, man, better preserved by cutting meat into thin strips and letting them dry in the sun. . With the discovery of fire, possibilities for increase conservation benefit from the use of smoke and cooking. In the fifteenth century cattle were bred outside the cities, killed the animals cutting rooms, and parts were sold to butchers. But it was different with the pigs, the pig was growing up in the villages, were killed in the streets and the sausage was prepared by the family. The custom is something that still exists in some towns. In Roman times some sausages are called "botulus" or "botellos" (for their shape), which are now botillos or botelos, that are made in Galicia, Asturias and Leon. The Romans had much fondness for sausages. We know that they had many variants of sausages and the "botulus" was a kind of sausage that was sold on the streets. One story could be told about the sausages, is that one of them (specifically the chorizo​​) went into space with astronaut Pedro Duque, one could say that is one of the things in the world that has traveled farther. One could also count as a story of the sausages, that King Alfonso XII of Spain, was a real fan of sausage (mostly Vic), report that while visiting the city of Vic always had to do three things: visit the bishop, the cathedral and the sausage factory. We can see therefore that the sausage was not invented today, as in the ninth century BC Homero found the consumption of sausage . In the Odyssey Homero names the gut filled with blood and fat, which could roast with fire. This is one of the earliest accounts we have of a sausage. One can also say that with the development of new technologies has been developing slowly changing, adapting to the different periods. Known and appreciated both inside and outside our borders, cold cuts are one of the jewels of Spanish cuisine. Whether to eat alone, with bread, bread with tomato or as part of a dish, they are always great. 1 Loin: The most noble and valuable piece of the exploded carcass of Iberian pig. 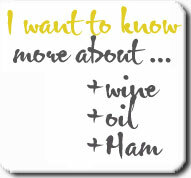 It can be defined as the extract of the quality of Iberian pig. Consequently, the Iberian Pork tenderloin is always a distinct piece of the back from the white back (in which there are very good quality), but unlike the ham and shoulder, in the sale for consumption is not usual to distinguish the type Iberian Pork as to its termination: the name of Iberian is sufficient. 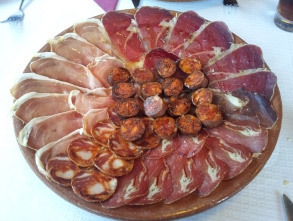 The essential distinction between sausage and cold cuts is given by the first complete works consist of cured within gut, while the latter suffer the same process as adding minced with other products. 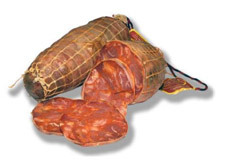 It is made from Iberian pig fat-free exterior, and seasoned with salt, pepper, oregano, lemon and some olive oil. The spine is kept clean of fat during 24 hours at temperatures between 0 and 21 ° C and for about 48 hours marinate stuffed into gut . Is then hung on dryer at a temperature of 18-20 ° C and relative humidity of 80-85% for 24-48 hours. Subsequently subjected to temperatures of 12-14 ° C and 75-80% humidity for two months. The temperature is regulated by charcoal braziers The curing takes place in natural artisan premises for about three months. It has a light red color outside and inside bright red . Its ideal serving temperature is around 22 ° C.
The elaboration of the Tenderloin has as the main raw material piece that sits between the loin and the Palette, in the anatomy of Iberico pork. Its production process is identical to the pork loin. Many experts are calling it the sausage of greater appreciation. The traditional process of making sausage includes the following phases: Minced meat and bacon, mix with remaining ingredients and dough resting in a cool place overnight, then the mass is introduced in pork gut, tied and exposed to air in a natural environment, whichever suitable locations based on their characteristics of temperature and humidity. During the maturing period there are processes of acquisition of desiccation and firmness of texture, while the flavor is developed, resulting from the addition of natural flavorings and those resulting from microbial activity on the components of the sausage dough. 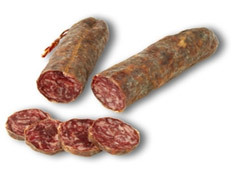 Made with lean pork Iberian the sausage is very tasty, because of its high fat content. It is also sometimes combined with white lean pork, giving a more gentle flavor. Season with salt, pepper, and sometimes nutmeg or cayenne pepper, and has a maceration period of 24 hours. Once stuffed into pork gut, cured by natural drying about 40 days in the hold. Originally from the island of Mallorca, is a sausage with a great history and tradition. Is prepared with pork, both lean and fat, and seasoned with salt, pepper and paprika. It is much more tender than other meats, and comes in elongated shape. 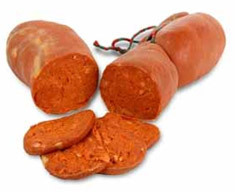 The sobrasada is used in many dishes of the Balearic Islands. Among the rituals of the pig slaughter and as a preliminary to this, there is always the preparation of the onion to be embedded in one way or another with blood to make blood sausage. They are usually the product of the family tradition of killing pigs. Today they are served in tapas or snacks. There are many varieties depending on its area of elaboration. Una vez cocinado para su degustación, predomina el olor a magro cocido, salazón y especias naturales, siendo su textura hebrosa y jugosa, no homogénea. Uno de los componentes fundamentales utilizados en el adobado del Botillo del Bierzo como conservante es el pimentón. El pimentón se obtiene de la molienda del pimiento desecado. La comarca del Bierzo es una zona tradicionalmente productora de pimiento. Algunos productos similares al botillo del Bierzo elaborados en zonas geográficas limítrofes no llevan en su composición el pimentón ya que en dichas. 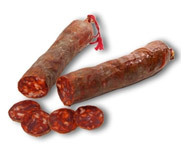 El Chorizo de Cantimpalo es un producto embutido y curado, elaborado a partir de carnes frescas de cerdo graso a las que se adicionan sal y pimentón como ingredientes básicos y a las que también se puede añadir ajo y orégano, sometidas a un proceso de secado-maduración. Se podrá presentar entero, troceado o loncheado. La zona geográfica de elaboración del chorizo, con una superficie de 2.574 km cuadrados, está constituida por 72 términos municipales de la provincia de Segovia, que constituyen una franja de 40 km. de ancho sobre la vertiente norte de la Sierra de Guadarrama y que presentan una altitud superior a 900 metros. Presenta unas características de orografía y clima que da lugar a unas condiciones climáticas favorables para la curación de los chorizos, fundamentalmente por su altitud y por tener muy pocos días de niebla al año (sólo 15 de media). Se diferencia entre productos Ibéricos de recebo, de bellota o de campo, dependiendo ello de la crianza del cerdo. Guijuelo se encuentra al sudeste de la provincia de Salamanca. Sobre una altitud superior a los mil metros, es la comarca española más importante en la artesanía del cerdo ibérico, ya que elabora más del 65 por ciento de los productos ibéricos nacionales. La situación geográfica de Guijuelo, hace que su clima sea eminentemente continental, con la particularidad de que los vientos proceden de los cuatro puntos cardinales debido a la falta de protección vegetativa. La elaboración del jamón o embutido puede hacerse en los 77 términos municipales situados al Sudeste de la provincia de Salamanca en los que las condiciones ambientales son similares, aunque en algunos casos, como en Ledrada, la altura sobre el nivel del mar es menor. La consecuencia de todo ello es que el proceso de maduración es más largo en la práctica, aunque en el Reglamento tiene prácticamente los mismos límites que el de Huelva. La zona de elaboración la componen 31 municipios, todos ellos en la comarca de La Sierra y a una altura de entre los 500 y los 1042 metros sobre el nivel del mar. Su clima de montaña recibe la influencia mediterránea y atlántica, con pluviometría alta, veranos frescos e inviernos suaves, y una vegetación muy variada de olivos, palmeras, castaños, pinos y predominio de la encina y del alcornoque. Uno de los caracteres diferenciales de estos embutidos es la incidencia que tienen en su aroma y sabor los frutos de este árbol, que le dan un toque especial. La Denominación de Origen admite cerdos de las provincias de Huelva, Sevilla, Córdoba, Cádiz, Málaga, Cáceres y Badajoz, y su período óptimo de maduración es más corto que el que se necesita en Guijuelo. Es el punto tradicional de elaboración y posiblemente el primero, cuya fama transcendió a la literatura con Lope de Vega, que aludía al “jamón presunto de español marrano; de la Sierra famosa de Aracena; donde huyó de la vida Arias Montano”. La localidad más famosa que se dedica a la producción de jamón y embutidos con Denominación de Origen, es Jabugo. El "Jamón de Teruel" fue el primero de España avalado por una denominación de origen. El nacimiento de esta denominación tiene como principal objetivo conseguir un producto de gran calidad, sometido a un riguroso proceso de selección y curado. La provincia de Teruel es famosa por la calidad de sus productos del cerdo y en especial, sus jamones. Las características orográficas y su clima resultan ideales para el proceso de curación natural del jamón y los embutidos. El tipo de ganado apto para la producción de jamones con destino a la elaboración del jamón protegido por la Denominación Específica será el procedente de cerdos obtenidos en los cruces de las razas Landrace, Large- White y Duroc- Jersey. El jamón y embutido de Trevélez debe sus particulares característica organolépticas al medio natural (zona media baja del Parque Natural de Sierra Nevada) en que se produce, siendo este medio, clima y vegetación, el que condiciona el desarrollo de una flora microbiana específica. Así, por encima de los 1.200 y los 1.900 m, ámbito donde se producen los jamones de Trevélez se sitúan los encinares y elevado número de las especies vegetales endémicas que se pueden encontrar en Sierra Nevada. Con respecto al clima, en la comarca, y entre los 1.200 metros y las cumbres de Sierra Nevada se encuentra la zona fría, con abundante nieve en invierno y temperaturas frescas en verano. - Forma exterior: redondeada, perfilado en sus bordes hasta la aparición del músculo, conservando la piel y la pezuña, pero sin cascos. - Peso: mínimo de 3 kilos y máximo de 5,5 kg. 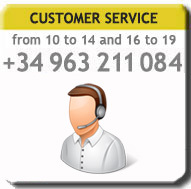 - Aspecto externo: limpio y firme con una masa muscular consistente. - Textura: firme al tacto. - Grasa: de consistencia untuosa variable según la alimentación recibida, de color blanquecino o ligeramente amarillo. - Coloración: del rosa al rojo púrpura. - Aspecto al corte: limpio, brillante, con grasa parcialmente infiltrada en la masa muscular. - Aroma: suave y agradable, exento de rancidez y olores extraños. - Sabor: poco salado, con retoques ligeramente dulzones. 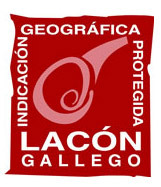 • Lacón Gallego Tradicional: procedente de cerdos alimentados exclusivamente, en sus tres últimos meses de vida, con productos tradicionales, a base de cereales, bellotas, castañas y tubérculos. • Lacón Gallego: procedente de cerdos alimentados con piensos autorizados y controlados por el Consejo Regulador. Los jamones, paletas y embutidos proceden de cerdos de raza ibérica, en todas sus estirpes, admitiéndose aquellos animales que tengan un mínimo de 75% de esta raza y un máximo de un 25% de las razas Duroc y Duroc Jersey. Indicación Geográfica Protegida Salchichón de Vic o Llonganiça de Vic. Embutido elaborado con carne de cerdo y tocino además de sal y pimienta negra como únicos condimentos. Ningún otro elemento, aparte de la flora microbiana, interviene para dar el gusto al Salchichón de Vic - Llonganissa de Vic. En la fase de maduración el embutido va disminuyendo su actividad de agua por el proceso natural de deshidratación y para que se produzca un sabor típico y una perfecta génesis del aroma, es preciso que se desarrollen los mohos y las levaduras que están implantados en el interior del embutido. El lento y constante desarrollo de la flora típica de la Plana de Vic confiere al producto final el inconfundible sabor de este embutido. "De forma cilíndrica más o menos regular, presenta al corte color rojizo con el tocino visible a dados y la pimienta negra en grano. El color exterior es blanquecino debido a la flora externa que le es propia. "Existe una gran variedad de tripas naturales utilizadas en la elaboración de este producto que condicionan el calibre, peso y longitud del producto. - Longaniza: se presenta en forma de collar o herradura. Se distingue por ser larga y fina, y suele tener un peso de 200 a 300 gramos, es la presentación de consumo más rápido. - Rizada: es la más común. El proceso de curación es de seis a doce semanas. Suele pesar 800 g aproximadamente. - Semirizada: como la anterior, pero de menor peso, aproximadamente de 400 g.
- Culana: piezas grandes y alargadas, que oscilan entre 2 y 3 Kilos. Se venden normalmente al corte. - Bufeta: tiene forma de bola y se ata con tres cordeles cruzados. Pesa entre 1 y 1,5 kilos. - Bisbe: es la presentación más espectacular de todas, ya que puede pesar entre 4 y 30 kilos. Su comercialización es poco corriente. Está elaborada a partir de carne de cerdo, magro y tocino, pimentón, sal y pimienta. Queda prohibido el uso de colorantes ni artificiales ni naturales. • Delay aging due both to an increase of some antioxidants, such as, for example, peroxidase _ superoxide dismutase, as _ its high content of monounsaturated fatty acids. • Reduce the level of blood triglycerides. • Reduce total cholesterol level in blood. • They provide protein, fat, zinc, iron and B vitamins, among others, which is a very complete food, and very suitable for consumption.